It is also a metal that offers industry unique properties. It does not absorb neutrons, making it ideal for use in nuclear power and at low temperatures it is superconductive, making it ideal for super magnets. What makes Zirconium screws particularly useful to industry is their resistance to hydrochloric acid where they exhibit a corrosion rate of less than 5mpy at all concentrations and temperatures in excess of the boiling point. Even in 37% HCI, Zirconium screws do not begin to show substantial corrosion until 130°C (266°F). This performance is unmatched by any other engineering metal or alloy with the exception of tantalum. 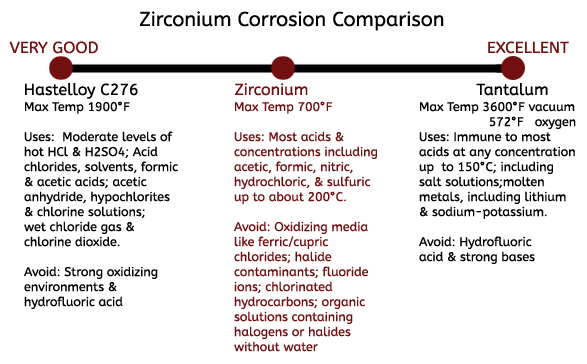 To give you a point of reference, Hastelloy C276 will experience 288 mpy (mils per year) of corrosion in just 10% HCl at the boiling point while Zirconium screws will have a nil corrosion rate even when aerated. As a result, Zirconium screws are most beneficial when used is in hydrochloric acid processes with temperatures above the boiling point and in the absence of oxidizing impurities. In addition to its impressive performance in hydrochloric acid, in sulfuric acid, Zirconium screws are resistant to temperatures well above boiling and at acid concentrations up to 70%. Only one other metal, tantalum, is equal to zirconium in nitric acid, where zirconium can be used in all concentrations up to 90% and temperatures up to 200°C. Zirconium is also resistant to most organic media and is considered one of the most corrosion resistant materiala in virtually all acetic acid solutions. Zirconium is known for its tough resistance to acid corrosion, but there are instances that it is not recommended to use Zirconium. Though aeration does not affect the resistance of Zirconium screws, even small amounts of oxidizing media such as ferric or cupric chlorides will greatly decrease its corrosion resistance. This often occurs from upstream equipment that carry corrosion contaminants into the zirconium equipment, making process control of upstream equipment critical in maintaining the corrosion resistance of Zirconium. In addition, acid in the presence of oxidizing halide contaminants and can accelerate the rate of attack on Zirconium screws even at low concentrations. Use of Zirconium screws in the presence of fluoride ions is also not recommended, even at low concentrations. • Zirconium has been used for decades in over 20 years in dye manufacturing for its incredible corrosion resistance and inertness. • Chemical processing plants often utilized Zirconium in the production of polymers that utilize strong acids . • Commonly used with nitric acid for the production ammonium nitrate for fertilizers. 99.2% commercially pure zirconium with the highest corrosion resistance. 95.5% zirconium with the addition of 2-3% niobium. This addition increases the impact strength of the alloy.